Building blocks are a great children's party idea. Whether you buy or make Lego party supplies, the Lego theme is sure to be a hit with all of the kids who attend. A Lego party is easy to put together without complicated decorations and other supplies, making it perfect for a birthday or impromptu party with friends. The easiest way to make a birthday party exciting is to purchase party supplies through a local party supply store or online retailer. Purchased supplies often coordinate with each other, offering an easy solution to pulling off a party without personally making supplies. Celebrate Express offer options for a Lego party that include table settings, banners, balloon decorations and more. Amazon offers a large assortment of Lego brand toys and party supplies, too. Visit local and chain party stores to see supplies in person. Use small mini Lego sets as kid party favors. Place Lego sets your child already owns around the room and host building contests for kids. 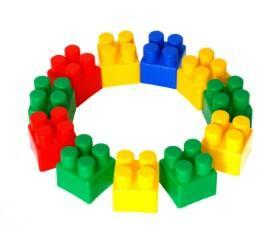 Use Lego branded items, like pens or keychains, as party favors or game prizes. Lego has several different product lines, ranging from Bionicle to Racers to Knights' Kingdom. If you are planning to incorporate a secondary theme, like a pirate party theme combined with Legos, purchase items that reflect it as well. Even if the additional items are not Lego brand, they still add ambiance to a specifically themed Lego toy party. Make your own party decorations and more for a Lego party. The simple block shape of Legos makes them easy to replicate, even for the least crafty person. Use the typical Lego colors of red, yellow, blue and green to make most of the supplies. A Lego invitation is easy to make at home. Make one on your computer by searching for free Lego clip art and adding it to a printable party invitation. Alternatively, cut out a Lego block shape in one of the main colors, gluing on a white index card sized paper with pertinent party information. Use a font with block lettering to coordinate with the building blocks theme. After Lego building contests are complete, have the kids move their creations to the table for no-fuss centerpieces. Make large block centerpieces by gluing halved toilet paper rolls to the top of shoeboxes and painting them in Lego colors. Laminate old instructions to Lego sets to serve as placemats.Make food that reflects the Lego theme. Cut a party sized sub into small rectangular portions and use toothpicks to add stacked pickles to the top to represent bricks. Make bricks using flavored gelatin and rectangular and round cookie cutters. Finally, finish with a Lego brick cake made by covering a sheet cake with fondant and adding fondant-covered marshmallows or mini cupcakes to the top. The parent section of the Lego website offers several tips and ideas for throwing a successful Lego party. The ideas offered use few supplies beyond the Lego toys themselves, making it simple to follow their suggestions. Party places for kids are popular options for people who do not want to host a party at their home. Families who are near Lego stores have the option to host birthday parties at the store itself, which includes most of the party supplies. Several package options are available for various prices, so call or visit your local Lego store to learn more. Regardless of whether you purchase or make your Lego party supplies, kids will enjoy the building themed party with their friends.